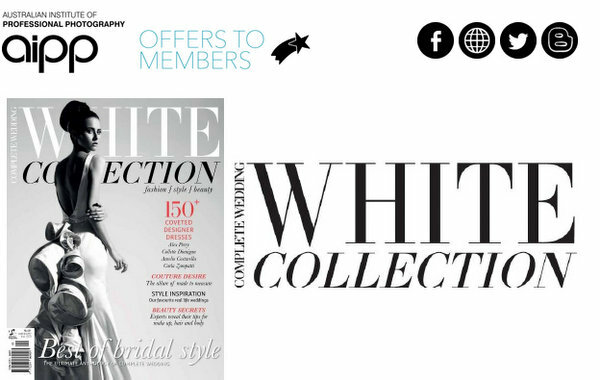 Specialist magazine publisher Universal Publishing is seeking free photographic spreads from AIPP members for its bumper wedding annual, White Collection, as part of its sponsorship of the Institute. The AIPP described the opportunity as ‘wedding photographers only editorial opportunity with Complete Weddings’. Source: Supplied. Photographers are asked to ‘create a styled shoot’ and submit at least 10 images with captions – featuring ‘fashion, beauty, cakes, flowers, stationery and props’. Images must never have been published before in any other magazines or websites. A concerned AIPP member shared the email with Pro Counter, with a note that the offer is essentially a ‘time for print’ arrangement, ‘which is the complete antithesis of everything we’re taught at seminars’. AIPP executive officer, Peter Myers, informed Pro Counter that the Institute believed members who already advertise in Complete Wedding could gain additional exposure and raise their profile at no additional cost. While the White Collection’s call for submissions isn’t a photographic competition as such, it does have some of the characteristics of one. The staff at Complete Wedding will pick the winning submissions, and those photographers are awarded with magazine space. Longstaff says this is the first time the publication has accepted submissions, and that the staff have ‘selected a few excellent shoots already’ from photographers. She added that in the past ‘all photographers have been commissioned’. The 2014 edition of White Collection was sold on news stands for $12.95, and advertising space starts at $2000 through to $8000 for a double page spread. Universal Magazines publishes the annual White Collection and Complete Wedding magazine, along with around 60 other specialist magazines. Submissions closed on Friday May 28.